This week has been a pretty good one. It started out with a student spotlight on Stefanie Japel's blog, and I got lots of good knitting time in. I wrote up three patterns, sent one sample off for an upcoming design, and went to Zumba (my new obsession) twice. I thought I would share with you this letterpress print I bought from Heartfish Press: Just seemed like some excellent art to have on the wall in the guest bedroom/yarn room/design studio. Happy Friday. Happy Weekend. Happy Knitting! Sometimes, you just need a little stash enhancement. 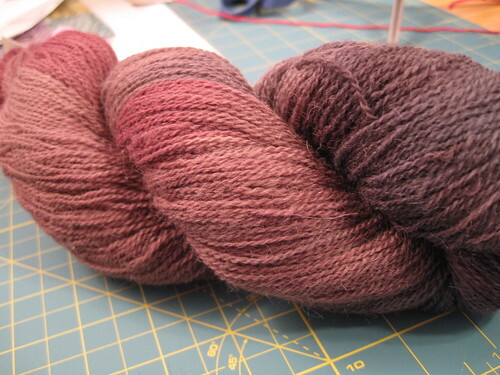 I had been longing for some Sanguine Gryphon yarn for some time. 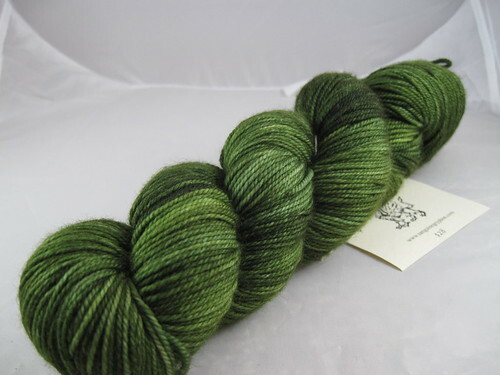 I finally caved and got some in a recent Loopy Ewe update. I couldn't decide between Bugga and Skinny Bugga, so I got one of each. They are as soft and squishy and beautiful as I thought they would be. 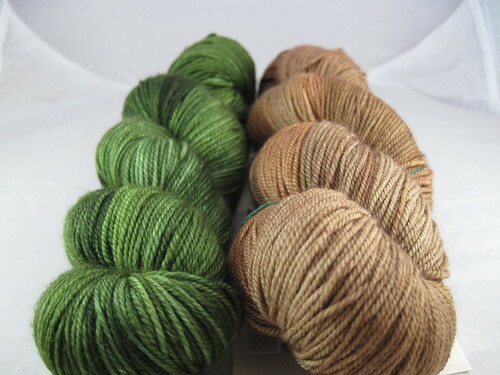 The one on the left is Bugga in the Leaf Insect colorway. 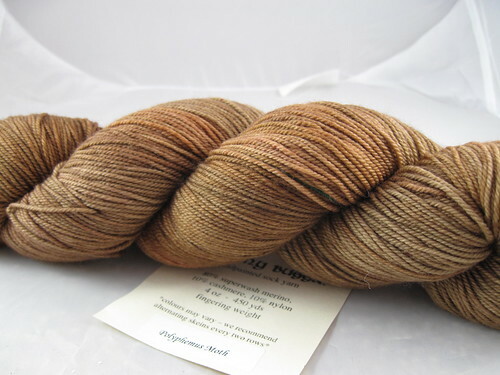 The one on the right is the Skinny Bugga in the Polyphemus Moth colorway. I have no clue what they will become. I will probably let them sit around for awhile so I can admire and pet them (wow, that sounds totally creepy, and yet, is true). It's all my fault. . . . 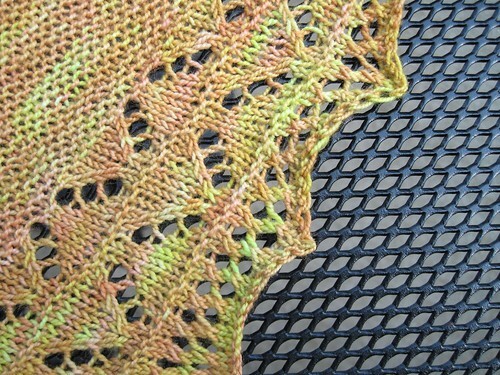 So, I have been teaching a class on knitting the Carefree Shawl (it's all Carefree all the time over here it seems, huh!?) at Fuzzy Wuzzy Yarns in Arlington Heights. 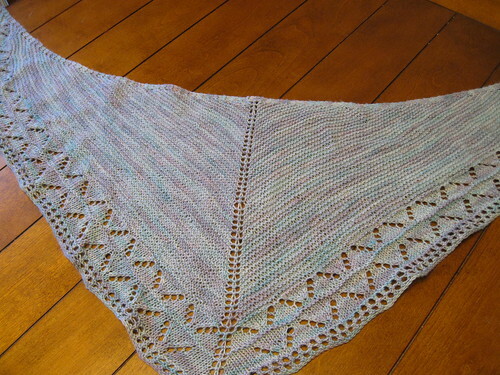 This round I decided to knit a shawl along with my student. Hooray! The Carefree KAL is underway! How is everyone doing with their shawls so far? I took some pics of me starting my shawl, I thought I would share them with you. 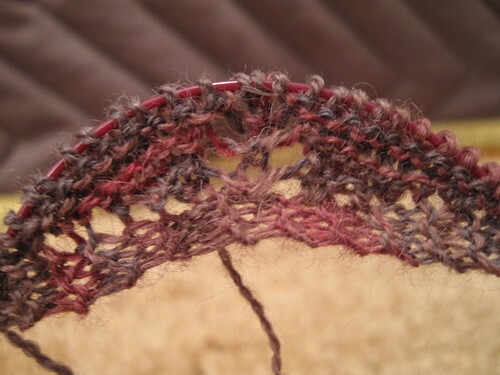 I tried to do them step by step for anyone who hasn't cast on a shawl like this before. 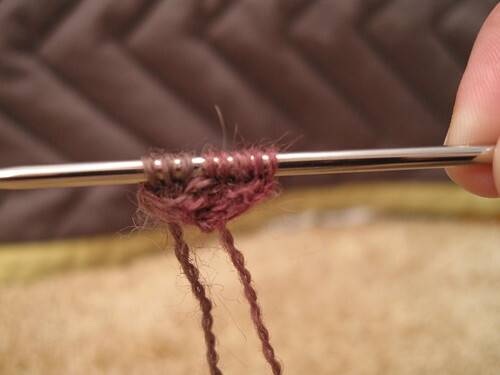 I cast on my three stitches and knit six rows. . . .
Then I turned and started picking up along the edge of my knitting. . . .
And came out the other side with 6 stitches on my needle. . . . Then I turned again and started picking up stitches in my cast on edge (this is always the trickiest part from me, which can sometimes result in swearing). . . .
And I ended up with nine stitches (and what looks like what I describe as a blob o' knitting). . . . 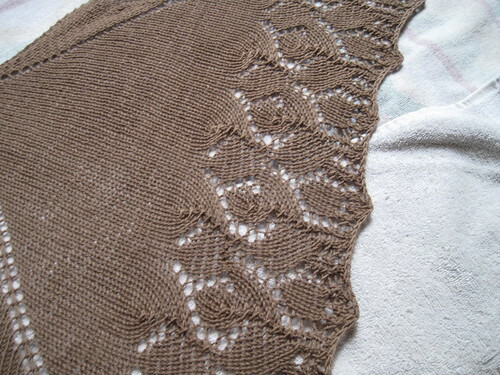 So I knit the first few rows of the pattern, and now it's starting to look like a shawl! 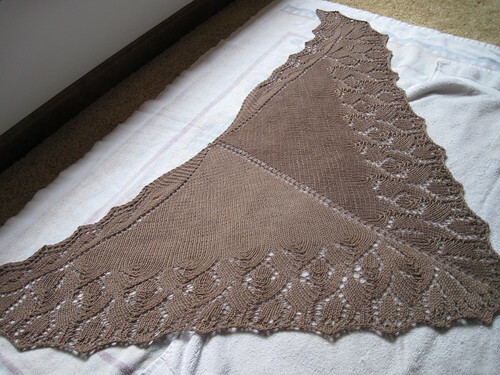 Have you blogged about your shawl? If you do, shoot me a message and let me know. I will be happy to share the link here! 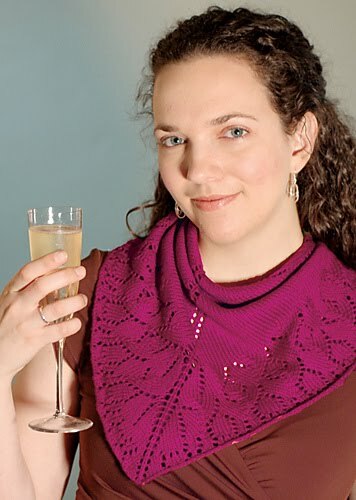 I caught a glimpse of Crooked Knitter's shawl in her post about Vogue Knitting Live (so jealous that you were there, btw). So, has everyone picked out their yarn? All ready to go? 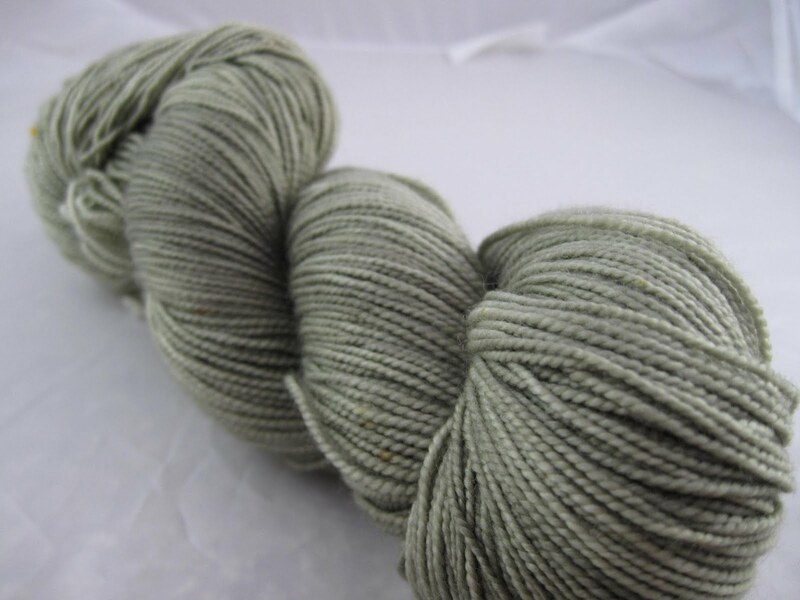 The yarn above is what I finally picked out. It's some hand dyed alpaca/merino yarn from Dragonfly Yarn shop in Janesville, WI. My friend gave it to me for Christmas. I am totally in love with it. 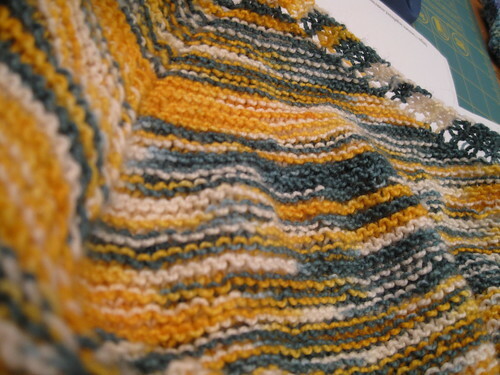 I think it is going to make an awesome Carefree Shawl! 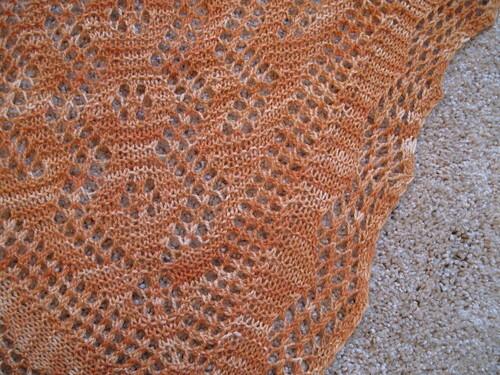 I will be posting over the weekend about my casting on and getting started with the shawl. I plan on starting it tonight! Just wanted to touch base with everyone on the Carefree KAL. I am so excited for this thing to start. I have to still pick out my yarn, but other than that I think I am ready to go! Who? Anyone who leaves a comment on this post or heads over to my Ravelry group and checks in there. If you haven't signed up for the KAL yet, please think about it. Yarny prizes (tempt, tempt). What? 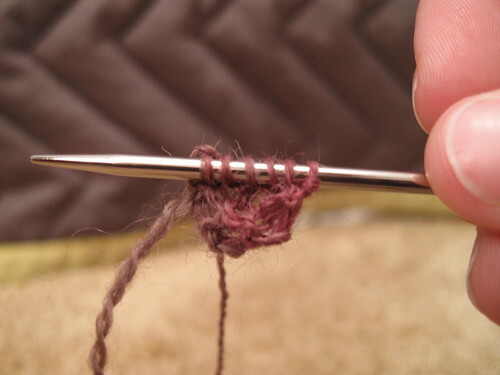 You need the pattern, a skein of sock yarn (about 400 yards) and a size 4 needle. Why? Because you can win yarny prizes! I have started working on getting those together and will hopefully be showing them off in the next week or two. Just a reminder that with this KAL comes coupon codes! 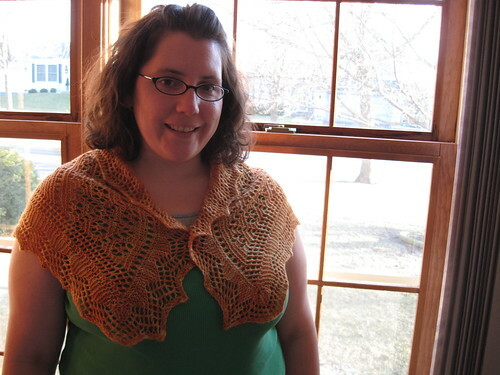 When purchasing the pattern on Ravelry, use the coupon code "carefreekal" at checkout and get it for just $3. That's half off! 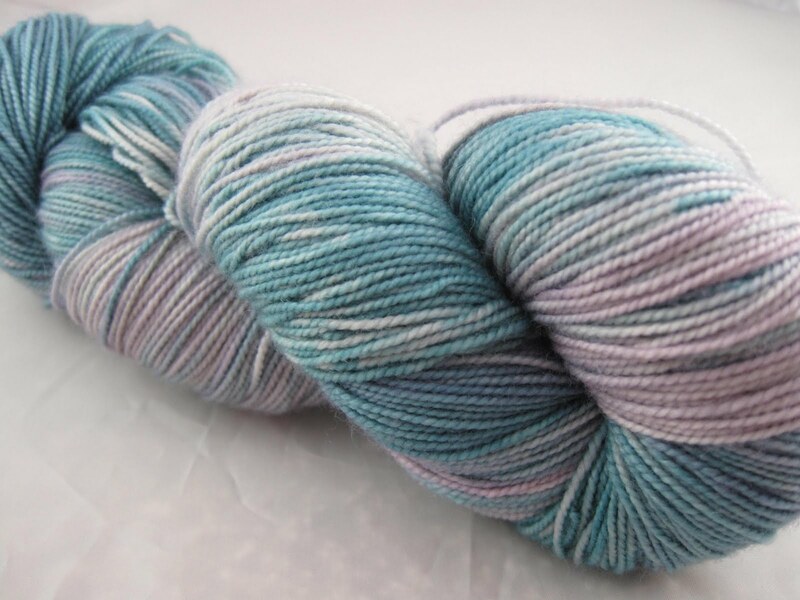 You can use whatever sock yarn you like, but if you want some Knitting Like Crazy yarn, you can enter the coupon code "CAREFREEKAL" at check out for 10% off anything. And, finally, I am going to list here everyone I have for the KAL. If I missed you, just leave another comment and I will add you to my list. So, I was notified on Tuesday that Interweave has come out with a free Knitting Daily app for iPhone and iPad. Since it was free, I immediately downloaded it to my beloved iPhone. 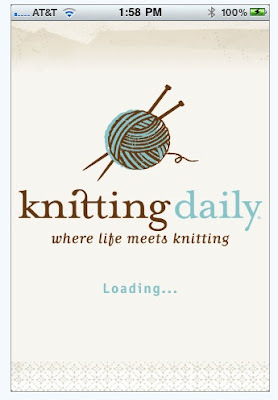 I have to say, this is my favorite knitting app I have found yet! All the other knitting apps I have downloaded I have found to not really be that useful. Maybe I was downloading the wrong ones, I don't know. Anyway, I went it with a little skepticism on this one. I thought it would be like the others. I thought I would think it was stupid. I was so pleasantly surprised by this app. I get the Knitting Daily emails, but honestly, I rarely read them. I typically deleted them with all the junk email (I'm not saying that I think they are junk mail, I'm just saying that's what happened to them when I got around to checking my email on the computer) because I never had time to read them anyway. Oh, but now I have them all easily accessible on my iPhone. I like that they are all in one place. It's like using a news app or something. I can check for updates when I have a spare minute at work, or while out, whatever. 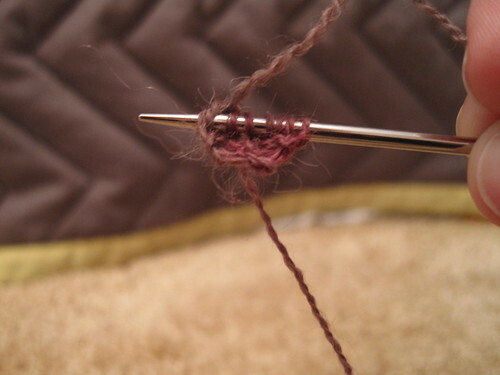 In addition to the Knitting Daily blog entries, there is also a section for videos. I think having these easily available on the iPhone will make things way better in my knitting life. I love watching knitting videos to try to learn new things! I never really sit down at the computer and do that. There is also a glossary section. What I like about this section is there are written directions and pictures! 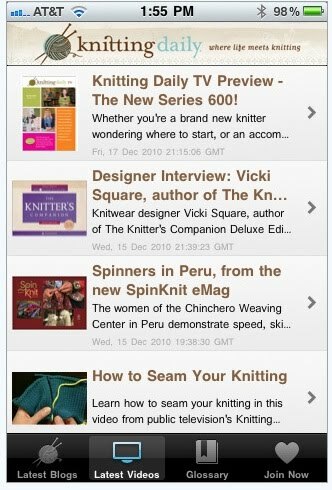 Thanks for listening to my thoughts on the Knitting Daily app. Stick around because tomorrow I'm talking a little more about the Carefree KAL. Interested? See the original post here. Disclaimer: I was not compensated for this review. Photos provided by Interweave. For my full disclosure policy, please click here. My latest design with Kollage Yarns came out at the end of last week! 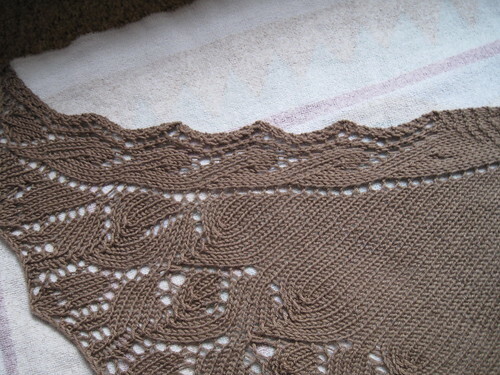 This shawl is knit out of just two skeins of Kollage Yarns 1/2 N 1/2 (it's 50% Wool/50% Milk Fiber). I don't know anything about the milk fiber, I just know that it is absolutely delightful! The pattern has both written directions and charts. So, whatever way you like to read a pattern, it's there for you! I again have to thank Melissa and Sarah for their very quick test knitting. And Cheeky Attitude sure does take amazing pictures, doesn't she!? 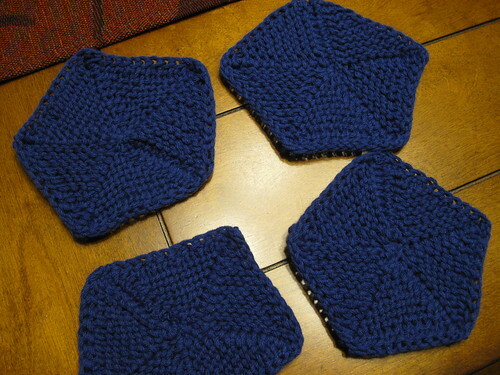 The pattern is available through Patternfish for $7.25 for pdf download. You can see more details about it on the Ravelry page here. Carefree KAL - More Coupons! 10% off ANYTHING in my etsy shop when you use the coupon code "CAREFREEKAL" now through 1/23!! 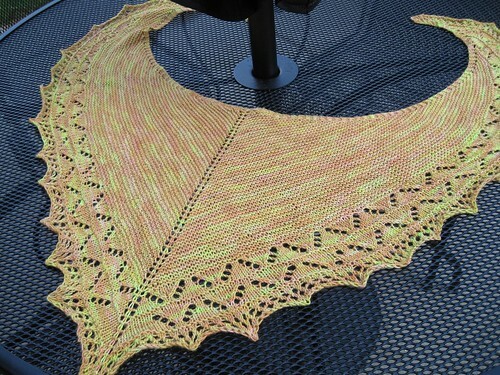 And remember, you can get the Carefree Shawl pattern for just $3 when you use the coupon code "carefreekal" at checkout. 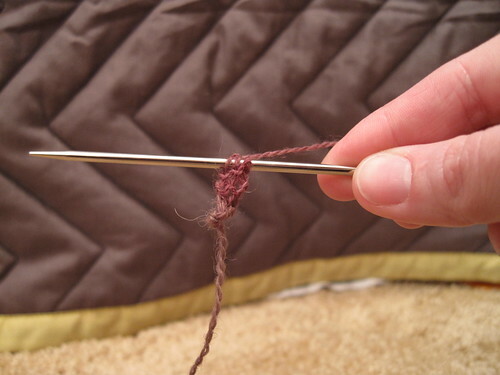 Want to join in on the Knit-A-Long? You can get all the details in this blog post here! 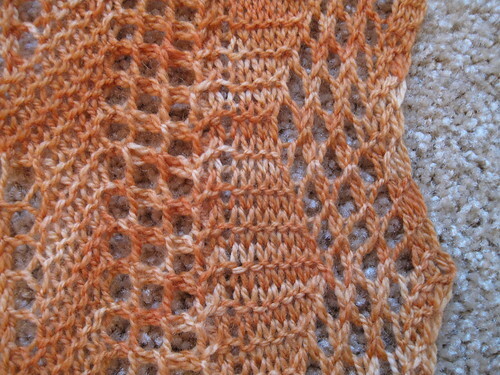 I am pleased to annouce a little knit-a-long on the blog! It's the Carefree KAL! We will be starting on January 21st and running until March 4th. Interested? Just join the Knitting Like Crazy group on Ravelry, or leave a comment on this post and I will add you to the KAL list. There will be chances for valuable prizes for those that participate! Yarn! Patterns! Goodies! And, if you join, you can get my Carefree pattern for just $3. That's half off. Be sure to enter the coupon code "carefreekal" (all one word) during checkout. 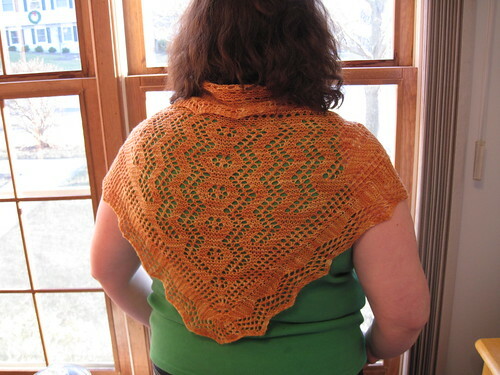 The pattern, available on Ravelry for $3 now through January 23. Enter coupon code "carefreekal" (all one word) during checkout to get the discount. Alex thinks this is the best shawl I have ever knit. And, I can't disagree with that. I love this thing! The pattern doesn't seem to be available anywhere online. 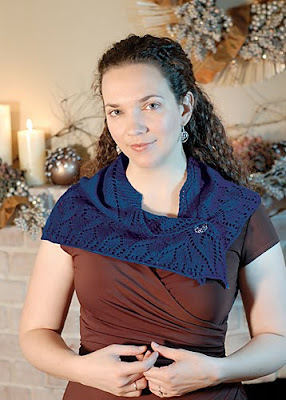 But, you could hook yourself up with The Gossamer Webs Design Collection: Three Orenburg Shawls to Knit, which contain similar Orenburg shawl patterns. Immediately following the class I got that book for myself and I found it to be very interesting. 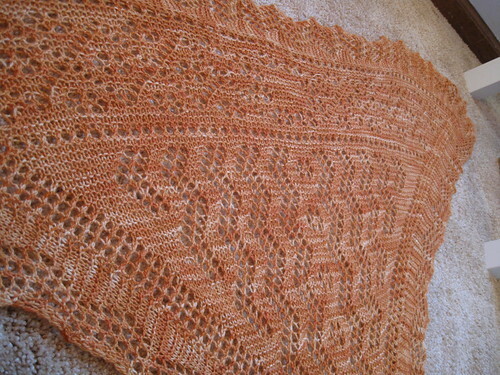 I knit this shawl out of a skein of Fearless Fibers Lightweight Superwash Merino Sock Yarn. 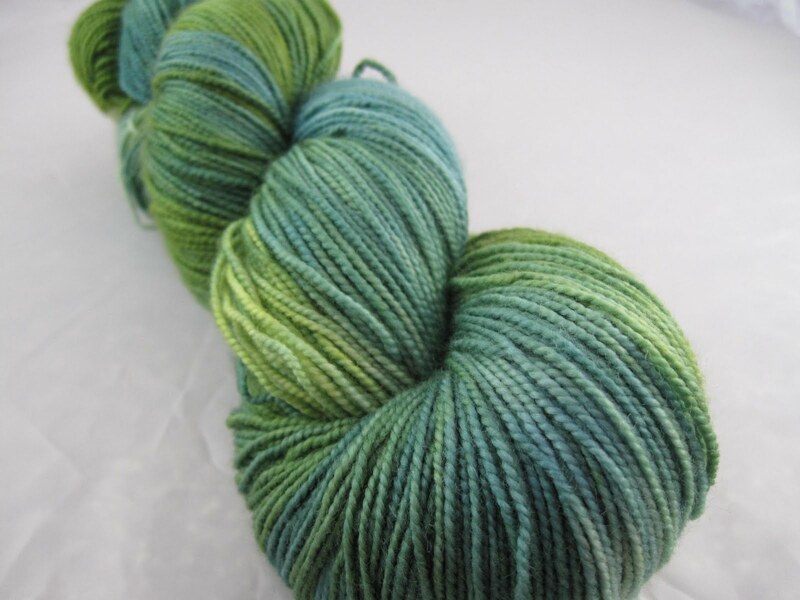 It's a discontinued yarn that I have been hoarding in my stash for a few years. I think this really was the perfect use for it! I knit these out off Berroco Weekend. I only used about half a skein. 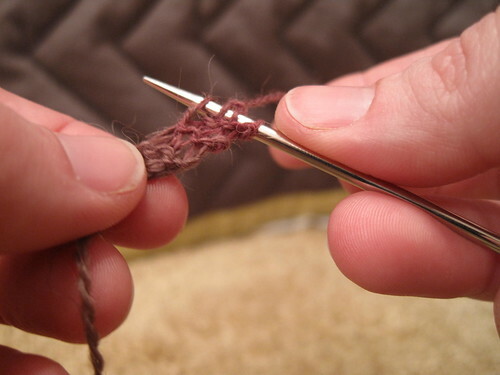 Want to knit some of your own? Well, you can get the free pattern here. What I have been up to lately? Just a little shawl knitting! Another new design for Kollage Yarns is on the way! This one is out of two skeins of their awesome 1/2 N 1/2 yarn. It's 50% Wool/50% Milk Fiber. A combo that is just so soft and smooth and still has some memory. Love. Love. Love. I am not sure yet when the pattern will be available, but once I have that info, you guys will be the first to know!